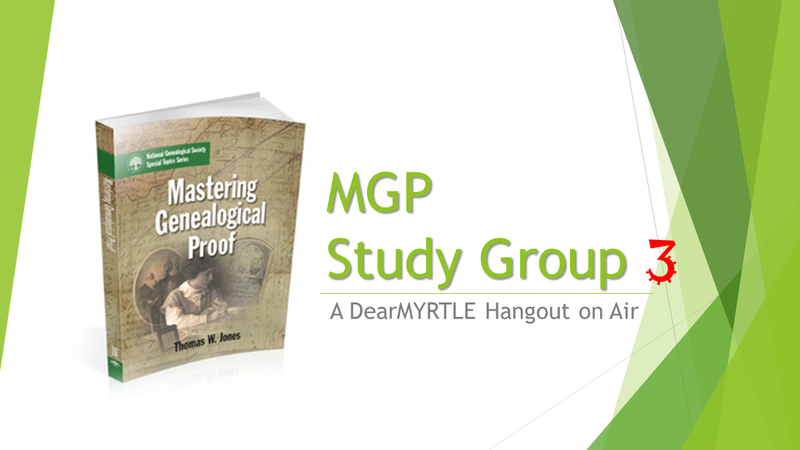 DearMYRTLE and +Cousin Russ look forward to hosting the third "MGP Study Group" focusing on Dr. Jones' Mastering Genealogical Proof in nine 2-hour sessions. There is homework posted in each chapter with suggested answers at the end of the book. This time, please read the chapter and finish your homework for the chapter BEFORE each session. 1. Purchase Mastering Genealogical Proof. 5. Equipment - Wired speed internet, a headset microphone and webcam. Panelist Orientation will take place on Thursday, 30 April 2015 at 9pm Eastern, 8pm Central, 7pm Mountain, 6pm Pacific US Time Zones.